Follow your Whimsey on social media! Learn more about Nick's book series, 30 Minute Shakespeare,HERE! Folger Education: 19 years as Teaching Artist in DC Public Schools, annual performance project at Folger Secondary School Shakespeare Festival. "You were a wonderful part of the festivities at the National Gallery's holiday party. The delight on the children's faces made it obvious that they were totally captivated by your merriment. Than you for making the party that much more special, and giving our guests and their children wonderful holiday memories." "Your show is a joy, your comedy outrageous. We loved every bit of it: the Ypsey accents, the bad puns, the witty asides, the audience involvement, the pratfalls. Thank you for a happy, hilarious and zany Saturday Morning at the National." 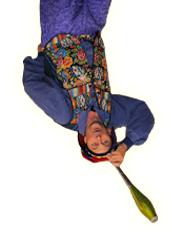 "Nick Newlin is one of the best performers I know to introduce young people to performance in an educational context. He in an artist, but he is also, first and foremost, an inspirational teacher. He has always entertained and inspired students, teachers and the public." "Thank you so much for visiting our Pied Piper Theatre summer camps this year. The kids love Nicolo Whimsey and are still practicing their juggling. I really appreciate both your commitment of time and your talents you share with the kids." "I would like to thank you for the wonderful show you performed at our library. I have had many terrific comments about your show. We had 263 people in the audience and I know every one of them had a great time. I am looking forward to working with you in the future." "Another triumph – How can I even thank you for the pleasure, joy and live you give those teachers, families and children. Seeing the faces of those children come to life when you come into their midst! I am eternally grateful." "Nick Newlin is our favorite assembly performer! 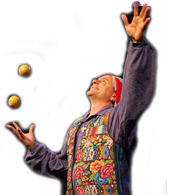 He has a wonderful sense of humor, appeals to both children and adults, and is a superb juggler! He has the entire audience in the palm of his hand- we can’t wait until he comes back!" "It is hard to describe the joy I felt at having one of our most cherished fantasies come true. It was so refreshing working with you because you took our preliminary ideas and transformed them into a vignette that was funny, theatrical, and a visual feast. Your contribution made our Harvest Festival an unforgettable occasion for all of us who were lucky enough to be there." © 2019 • NicoloWhimsey.com • All rights reserved.